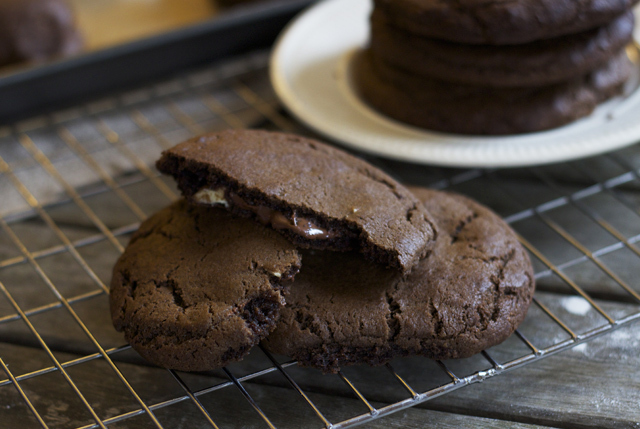 Double chocolate nutella stuffed cookies. Hello. 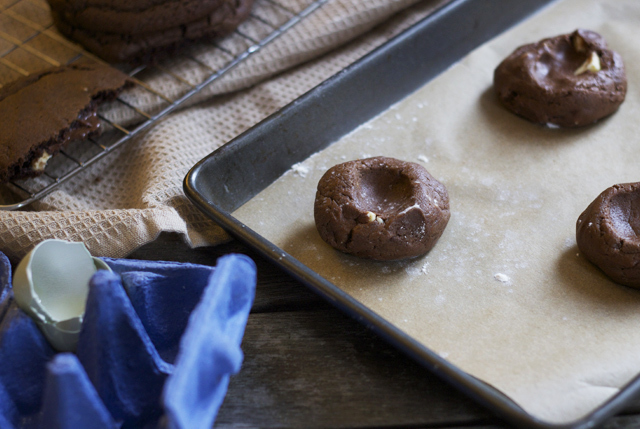 Here’s a recipe for cookies that don’t require a pre-bake chilling. Because no one, in the entire history of chocolate, has ever thought ‘Do you know what? I think I fancy eating some chocolate chip cookies in about eight hours time.’ No. No-one’s ever thought that. Ever. Cookies are for instant gratification, in my opinion. They need to be whip-upable in less than an hour to provide a quick fix for chocolate cravings, and be made up of store cupboard ingredients. Same goes for brownies. If a recipe requires eight pound’s worth of finest 80% chocolate, there’s a less than 1% chance I’ll be making it. I went through a phase of making these on a once-monthly basis, and scoffing them until I felt a little queasy. This time I’ve been sticking to the whole ‘half of the portion I once would’ve served myself’ thing, and it’s been worked out just peachy. Because half of *all the cookies* is still quite a lot of cookies, you know? Recipe adapted from the Hummingbird Bakery Cookbook. Nutella stuffage inspired by the oh so talented (and a bit genius) Izy. Makes approximately 12 large cookies. 2. Put the butter and sugar together in a large bowl, and beat until fluffy and well combined. Add in the eggs one at a time, making sure you scrape the mixture trying to make a bid for freedom up the sides of the bowl. Pour in the vanilla extract, and mix. 3. Measure out the flour, cocoa powder, salt and bicarb into a separate bowl and add in to the butter mixture in two batches, beating to combine between each addition. 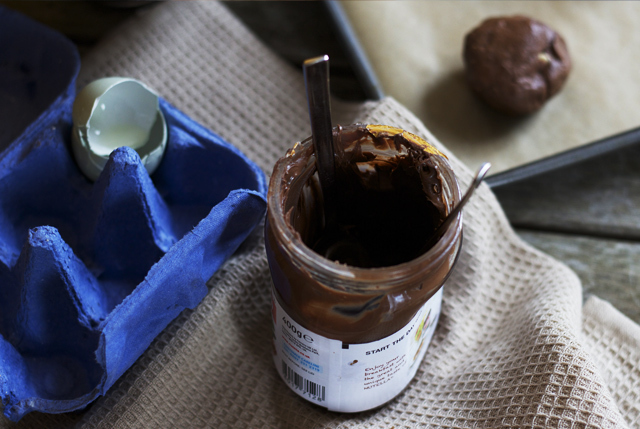 Once a smooth dough has been formed, stir in the chopped chocolate by hand. 4. Line two baking trays with baking paper, and place four golf ball sized amounts of dough on each tray. 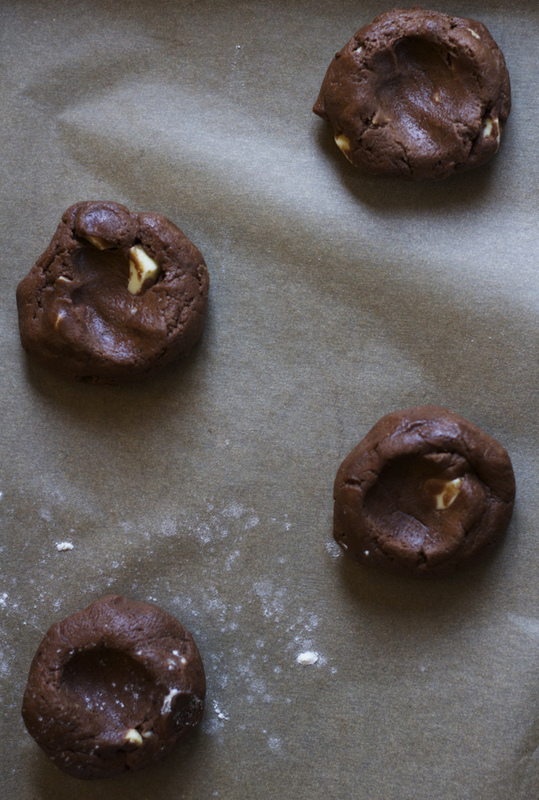 Gently press your thumb into the centre of each ball of dough, to form an indentation. 5. Spoon about a teaspoon of nutella into the centre of each cookie, then flatten out pieces of dough about half the size of the cookie bases and squidge them over the nutella-stuffed bottom halves of the cookies like little hats. 6. Bake for 10 minutes, until the edges just begin to feel cooked. Leave to cool for a few minutes on the baking trays after removing from the oven, and then transfer to a wire rack to cool completely. 7. Best eaten on the day of baking, whilst the edges are crisp and the centres are a little warm. Store in an airtight container once cool. p.s. 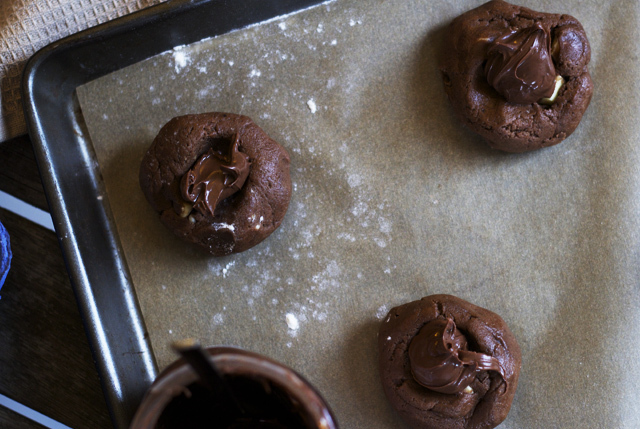 Any uncooked dough can be stored in the fridge for a day or so, until you’re ready for another chocolate fix. Winner! I’m sure it would work with gluten free flour! I don’t know what effect g.free flour has on baked goods since I’ve never worked with it before, so will have a little scout around online and get back to you! these look so so magnificent! need to make them asap! Well these look delicious! Its only 10am and Im craving some cookies! OMG Rosie, these look amazing! I think I’m going to have to make these this afternoon. 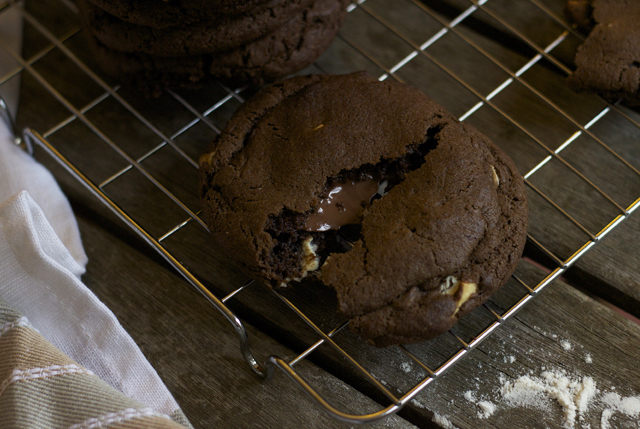 Cookies and Nutella…genius! Oh these look great! 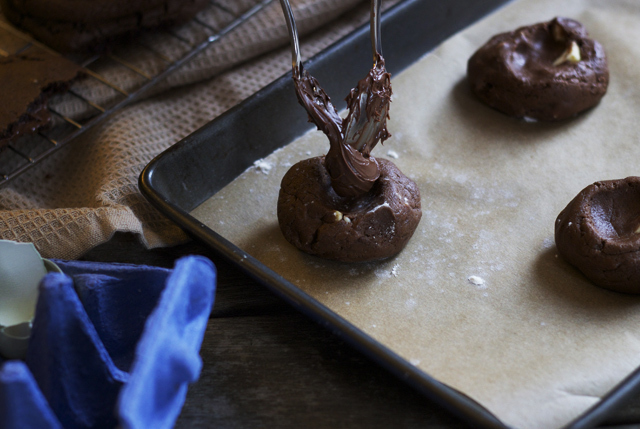 I love cookies and will definitely be trying these out soon! Wow, these look so decadent and delicious! This feels like falling in love. Drooling. These look very delicious. I can’t eat anything nutty anymore, because the boy is allergic, which is very sad, because I love them. 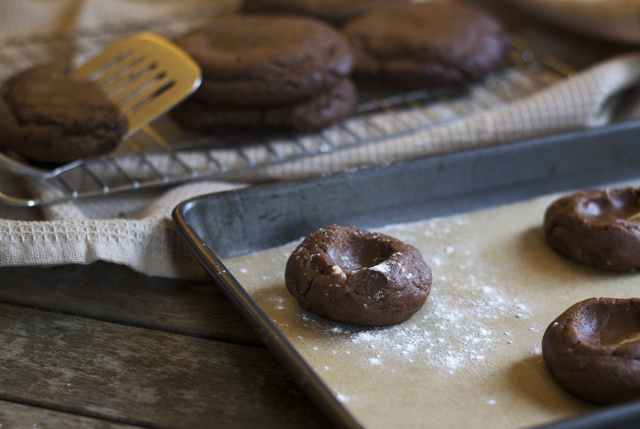 But maybe when I’m at home and he isn’t, I’ll have to make these… sneeky! Rosie, these look delicious. My boyfriend has just looked over my shoulder and requested that I make some for him as soon as possible! So GOOD!! LOL – love that it doesn’t need the pre-bake chilling! When I see that on a recipe I automatically skip it. Nope, not waiting – why would anyone do that to themselves?! 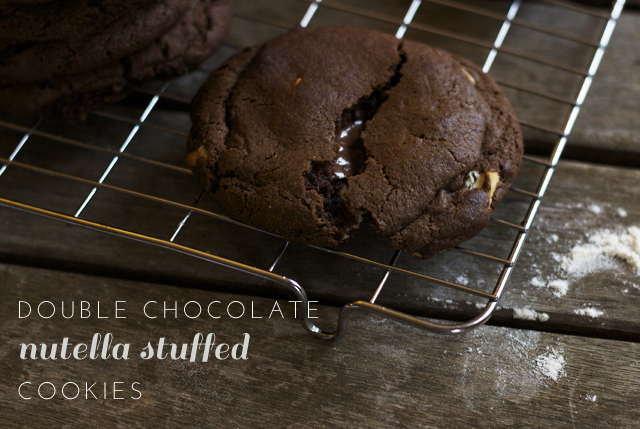 And put Nutella in anything and I’m sold – this looks soooo good! Great recipe and just in time for an afternoon tea the housemate and I will be hosting! Thanks! OH CRIKEY. Send me chocolate, pronto! oh hell yes. these look fantastic. Wow, these look amazing. Definitely a guilty pleasure!